The CJ3A Page Forum - flywheel timing marks? 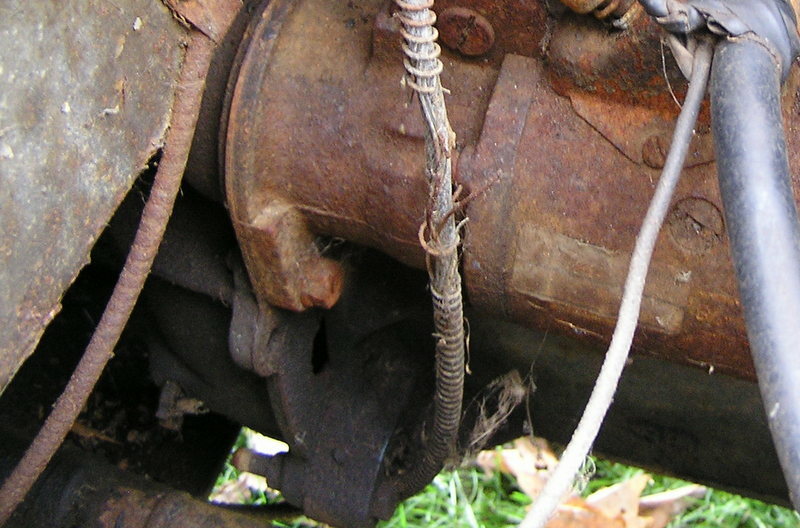 The CJ3A Page Forum › TECH FAQ SECTIONS › Engine compartment › flywheel timing marks? My engine is the style that has a partially covered timing port hole. So as you all know it's hard to see the timing marks. Sometime in the past the oil pump was changed and the new one was not installed correctly, so the location of no.1 spark plug on the distributor has changed. Given this situation are the timing marks on the flywheel still usable? The manual shows drilling out the material covering the hole. Is there a better method of opening up the hole? I would still use the timing marks on the flywheel. As long as the rotor points to the plug wire that goes to #1 spark plug at TDC or 5° prior it does not matter which way it is pointing. Remember the firing order is 1-3-4-2, rotation is counter-clockwise when viewed from above, so make sure all the plug wires are in the right place. I'm not sure what you mean by opening up the hole to see the timing marks. There is a removable cover over the hole, and yes it's hard to see the marks. Once you find it you might mark the front engine pulley and the timing cover for future reference. Does it look like the picture I've attached? If so, then yep, you have a "late, large flange" engine, and the larger flange partially covers the timing hole. My engine was rusted solid in the picture, so I never had to time it....but I have heard others do use the combo as-is and despite the smaller opening, it's still possible to set time that way. Like 1955CJ-5 said, even if the pump was installed wrong, I think you can still pick the appropriate new cylinder and the marks should work for you. It'll be tedious, but if you can paint the marks with something that sure would help. Come to think of it, I was under the impression that when they went with the larger flange in the back, the timing cover got a timing mark, as well as the pulley. So timing could be done with the more conventional method...of course if your engine is a mash-up of parts, previous owners might not have put the later timing cover (with accurate timing marks) onto the engine. But maybe you have a marked timing cover as Dave mentioned? Is there a notch or small hole in the lip of the front engine pulley? Some timing covers were marked with numbers and letters and others just had a crease or dimple in the timing cover..one edge being TDC and the other 5° BTDC..
and sure enough, it has a timing cover with accurate timing marks. So I would think you should too if it's not been messed with too much. If you do, it would still be a simple matter of finding what piston is on compression stroke at TDC with the marks (because of your incorrect oil pump installation). There was a period of time at the beginning of M38 production when the engine flange was made larger, it covered a portion of the timing inspection hole, and there were no timing marks on the timing cover yet. Athawk11 you nailed it, that is exactly what I have. 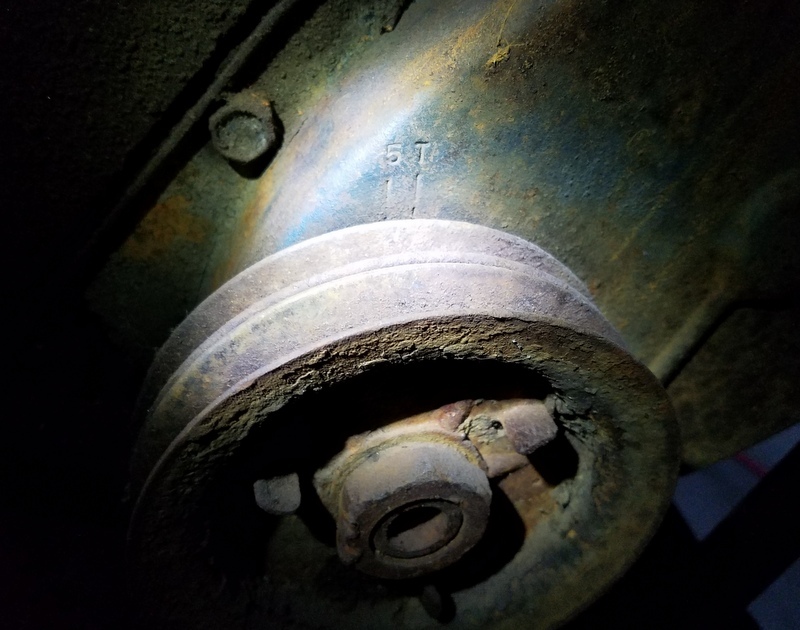 I have laid on the ground using a flashlight trying to see some marks on the flywheel, I did find some paint but could not id any timing marks. There is some info about drilling out the webbing to enlarge the opening. Just wondering if there may be a more practical way to open it up. I have looked on the crank pulley and timing gear cover for timing marks, no luck there. So I would need to replace the crank pulley also? I will clean some crud off the timing cover to see if there are any marks there. Thanks for the info and links guys. So I would need to replace the crank pulley also? Not necessarily. I have a mix and match of engine components on this one. A flywheel with no marks. No timing window. No timing marks on the cover. No pulley with groove or pointer. I found top-dead-center on the engine, then marked the timing cover and cut a v-groove on my existing pulley to match. Hawky, Is this the engine for Blackie? Decided to put a little color in your life, eh? Is it running yet? Do you have a rebuild thread on this engine that I missed? Would love to see what you have going on here! With the help of some brake cleaner and sand tape I found the timing marks ont the timing cover. But, no marks on the pulley. What should I be looking for? I sanded the rim of the pulley closest to the cover, it’s a dual pulley with the belt on the outside groove. I did the thumb thing on #1 and checked the points on the rotor for #1, # 1 is at the 1:00 position, not 5:00. I hooked up the timing gun and checked the pulley for timing marks , I looked at all four plugs wires but found no marks on the pulley. How critical is it to know if the timing ,using this method , is correct, can’t you use another method? If so, you guessed it, what is it? 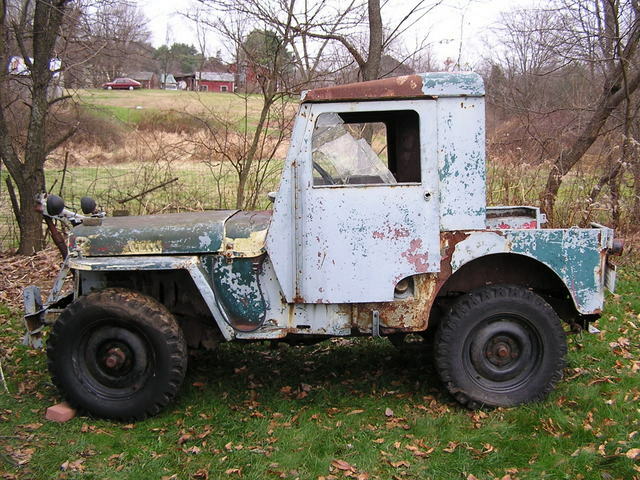 Old Jeep Carbs is a terrific resourse for carburetors and many things related to Jeeps in general. I've used every option shown on this page. The Geico method and the method using a vacuum gauge and tach reader are my "go to" choices now. I don't even own a timing light. Thanks for the info. I will give this a try.